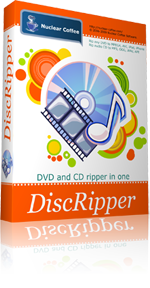 DiscRipper is the powerful DVD ripping software that will help you to rip DVD video discs or rip CD audio discs at high speed and without any loss of quality. With DiscRipper as your DVD ripper you can rip and convert DVD movies to all popular formats at high DVD ripping speed and perfect quality. For example, with this DVD ripper you can rip DVD to AVI, DVD to MPEG, DVD to WMV or rip DVD to DivX, and convert DVD to audio compatible format like MP3. This lightweight DVD ripper also allows you to convert DVD for your portable player, so you'll find it real easy to convert DVD to iPod, DVD to iPhone, DVD to PSP, DVD to Creative Zen, and 3GP / 3G2 for mobile phones. You can select preferred titles to rip, and select audio language and subtitles if available on DVD disc. DiscRipper will also fetch DVD meta-information and DVD disc cover images from internet. Furthermore, DiscRipper has a number of settings which are easy to customize and provide perfect video and audio quality in smaller size. DiscRipper does only rip DVD discs, but it also can rip CD discs with great output quality. So you can backup your favorite audio CD and rip CD to MP3 format, CD to APE, OGG or WAV audio file formats. This CD ripper will fetch all information on your CD from the internet database. 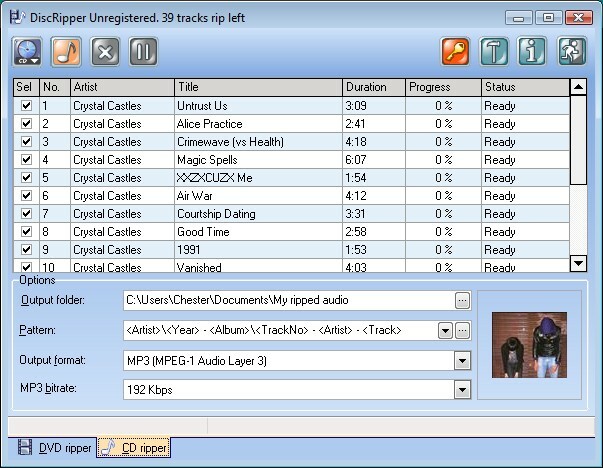 DiscRipper will identify the name of the CD, the artist that created it, the names of songs, album covers and even lyrics, so there is no need to do this manually anymore. 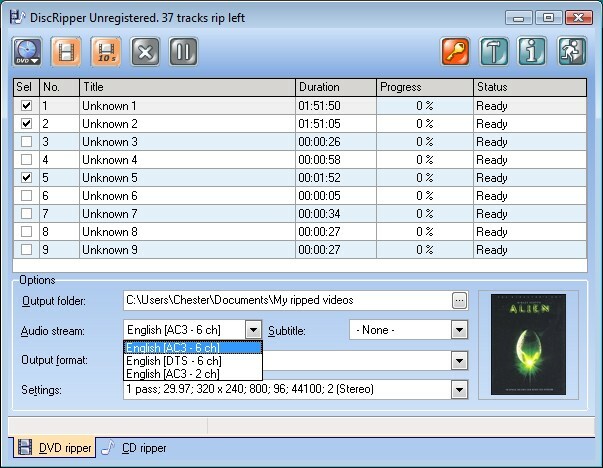 With DiscRipper as your desktop CD ripper, you can adjust your audio files by setting any desired bitrate, frequency, channels, etc. These options are for those who want to take advantage of them, though they are fully optional, which makes DiscRipper the perfect audio software for users of any experience level. Rip DVD video to your portable player, such as iPod, iPhone, PSP, Creative Zen. Customize the output format by setting audio / video bitrate, frame size, frame rate, audio sampling rate, etc. "10 second test rip" option allows you to check the output quality without ripping whole DVD title. Choose audio stream, language and subtitle language if such information is available on the ripped DVD. Get DVD meta-information. DiscRipper will automatically download all information about the DVD and DVD disc cover images from the internet database. Manage the ripping process by pressing the pause / resume buttons. Rip DVD in 1 or 2 passes. Rip CD to popular audio formats, such as MP3, OGG, WAV or APE. Get CD name, artist, names of songs and other information. 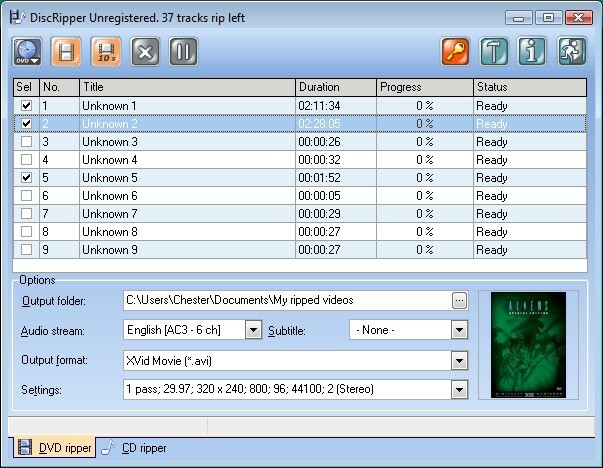 DiscRipper will automatically download all information about the CD from the Internet. So there's no need to look for and manually enter such information as name of the CD, artist who created it, names of all songs. Get album cover and other meta-data in just a few seconds. Get lyrics for all songs. DiscRipper will find lyrics for each song on the Internet automatically. Customize the output settings like bit rate, frame rate for fluency, sample rate, channel, codec and more parameters. User-friendly interface without any complicated settings makes it easy to use both for professionals and for inexperienced users.